Now that you have decided to travel internationally with your kids, you might be concerned about coping with jetlag. It is difficult to deal with as an adult, and harder on the little ones. We've had mixed experiences with our son, everything from him adjusting long before we did, to dealing with a cranky, over-tired child who bounces off the walls at 4 am for the entire trip. There are some things you can do to help the adjustment and enjoy your time away. When you board the plane, reset your watch to the new time zone so that you can gradually get used to the idea that it's the middle of the night there. Try to sleep on the plane if it is nighttime at your destination. When planning your trip, try to find a flight that arrives in the late afternoon or early evening. If your child sees the daylight when you arrive, he might be more apt to stay awake. Play outdoors at a park or take a walk after your arrive. Even though you will be tired and tempted to just go to bed in the middle of the daytime, try to have everyone stay awake at least until sundown. If your child needs a nap upon arrival, wake him up after an hour or two so that he can go back to sleep when it is dark. Try to stick to your home routines and time schedules as much as you can, even if it means waking your child up in the morning, or keeping him up until after dinner. Sleep when your kids sleep. Use the same strategy as when they were newborns and try to get some shut-eye when they do. When you wake up, at least you’ll be able refreshed enough to do a little sightseeing. Plan your big activities for 3-4 days into the trip. Don’t plan to go to Tokyo Disneyland or on a big hike in the Alps the first day you arrive. Give yourselves a resting day or two. Some families report that it can take up to five days to adjust completely, so bear that in mind when planning your outings. Use the natural light to help you adjust to the new time zone. Go out in the sunshine when you can, and sleep with the shades up so that the morning light will help re-regulate your body clock. When the sun comes up, you will soon start to feel like moving and doing things again. Try to stay awake for longer periods each day and sleep a bit more each night. Take a brisk walk in the early evening, or seek out local treats or the something familiar to the kids, like the ubiquitous McDonald’s. Some parents prefer not to adjust their schedule and just pretend they are in their home time zone. This works best if the time difference is 3 hours or less. Even if the clock is completely reversed, you can still do this if you want, but you probably won't get to do much during your waking hours. In big large cities, you can find fun things to do in the middle of the night, though "attending a toddler rave" is probably not in the cards. If your child is awake in the middle of the night, allow her to play quietly or look at books with dim lights in the room. TV and other noisy distractions will likely be too stimulating and keep her awake even longer. On our first trip to Japan with our son when he was 2, he spent the hours between 3 and 7 am jumping from one bed to the other, over and over and over, after half an hour of Japanese late night tv. Everytime we put him down to sleep, he popped back up. By 7, when we were ready for breakfast, he was exhausted. He slept until 4 in the afternoon, and we were pretty much captive in the hotel room until he woke up. I still curse Pokemon. A better tactic if you are traveling to Asia and find yourself wide awake at 4:00 am is to take advantage of the early morning hour and spend time cuddling with your child in your pajamas, reading books, and telling stories of the wonderful things you’ll see in this new place. At the very least, you can beat the crowd to breakfast when the buffet opens at 5! There are prescription and herbal sleep-aids that you can try, but be sure to consult your pediatrician or herbalist before giving any new medication to a child. If you go this route, try the medication out at home, so if there are side effects or problems, you can see your regular physician. My husband has tried Melatonin on short business trips to Asia, with some success. One mom in my parents' club recommended an herbal tincture called "Fly Right" that is bottled by a local acupuncturist, Dr. Ted Ray, for use in adults. Again, these sleep aids are normally used by adults, and I don't recommend giving anything to your child without clearing it with your pediatrician. Relax and try not to stress about keeping a tight schedule or try to do too much. You're on vacation, remember? 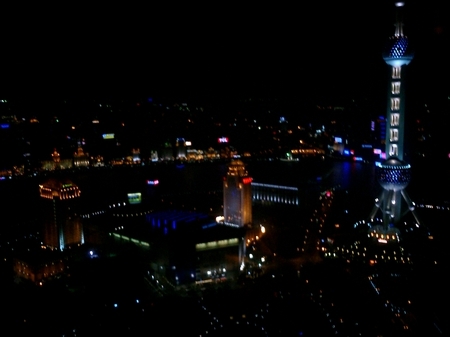 Photo: Shanghai at 4 am taken by Frank, 2004. Thanks to the members of the Parents Club of Palo Alto & Menlo Park for sharing their suggestions with me.